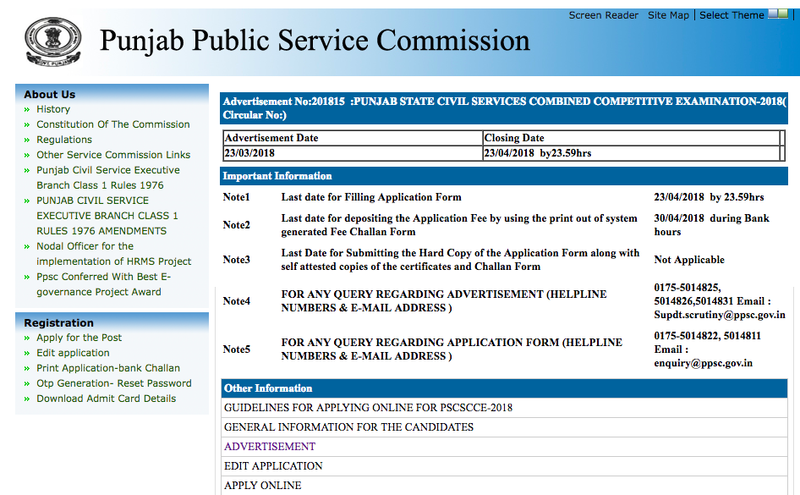 The Punjab Public Service Commission invites Online Application Forms from eligible candidates for recruitment to Sixty Seven (67) posts to be filled through PUNJAB STATE CIVIL SERVICES COMBINED COMPETITIVE EXAMINATION – 2018. (i) The candidate should possess a Bachelor's degree in any discipline from a recognised university or institution. (ii) The Candidates must have passed Punjabi of matriculation or its equivalent standard as on the last date of receipt of Online application Form i.e.23/04/2018. Candidates should not be below 21 years and above 37 years of age as on 01-01-2018 except the posts of Deputy Superintendent of Police and Deputy Superintendent Jails/District Probation Officers.